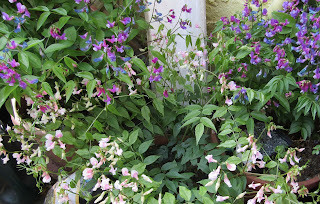 The promised hot weather did appear for a few days and brought the garden on very quickly. 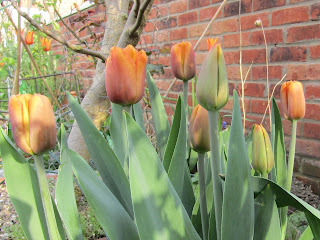 My tulips, which had been shivering and tightly in bud, suddenly grew and flowered. 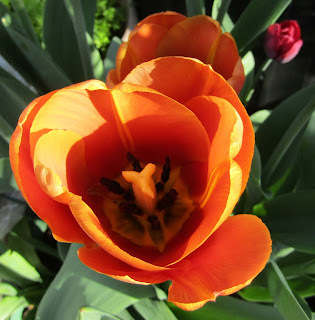 Above is the ever faithful Ballerina with the citrus scent. 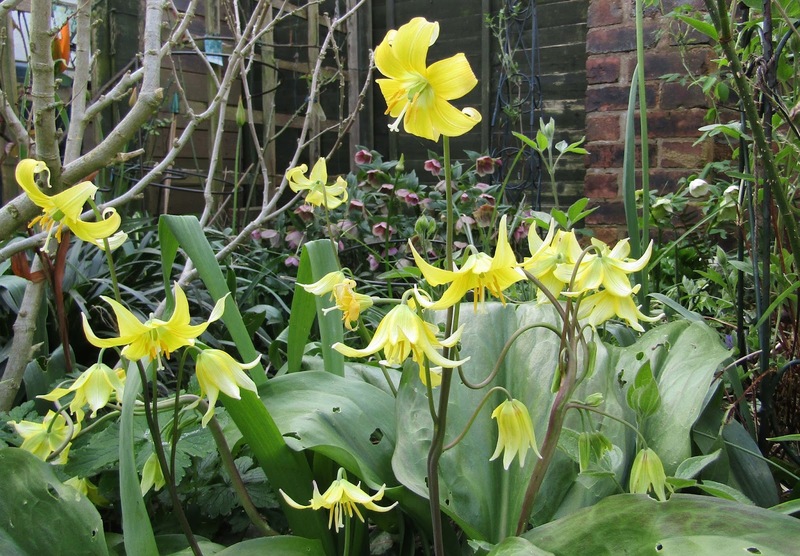 (However, the new Ballerina bulbs I planted last autumn have been thrown by the cold and are just leaves, with no sign of flowers at all. Some of the other tulips are a bit stunted too, but I hope that if I plant them in the border this autumn, they might be better next year). 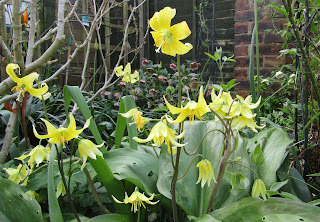 My erythronium Pagoda has gradually grown and spread and is looking wonderful this year. ...and fully open - really beautiful. I need more of these. 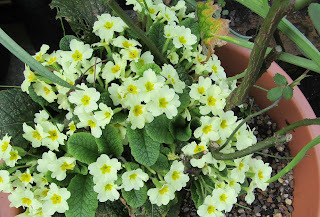 This self sown primrose is keeping a rose in a pot company although I think I will have to remove and divide it soon. 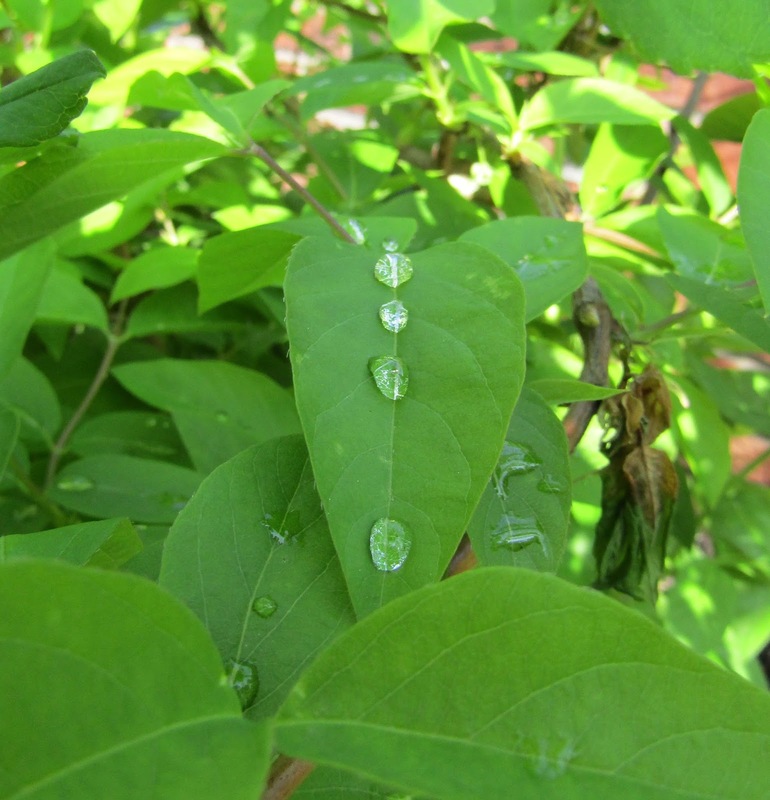 I couldn't resist capturing these jewel like raindrops one morning. Here they are on the winter flowering honeysuckle. 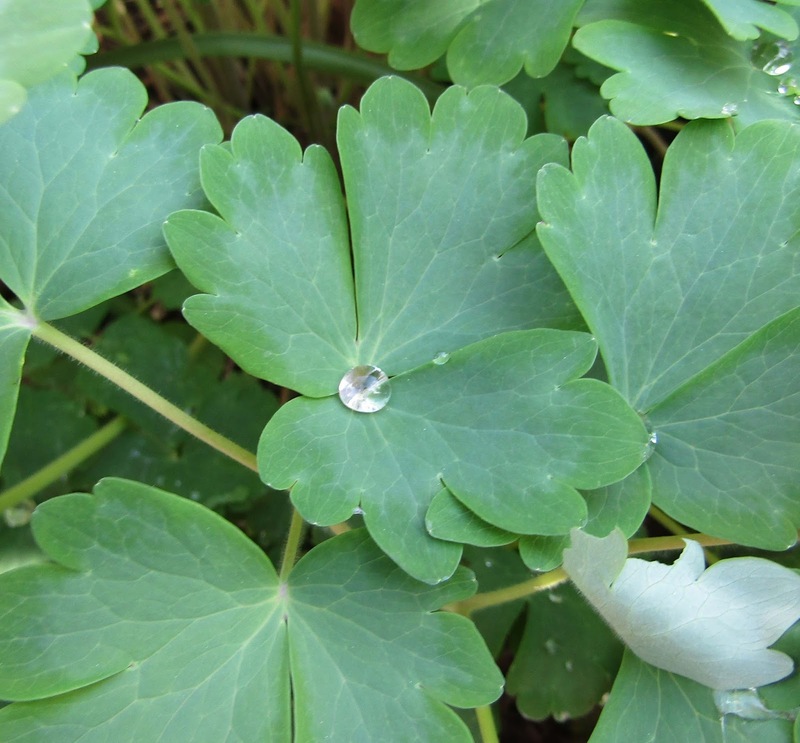 While one single droplet stayed in the centre of this aquilegia leaf. 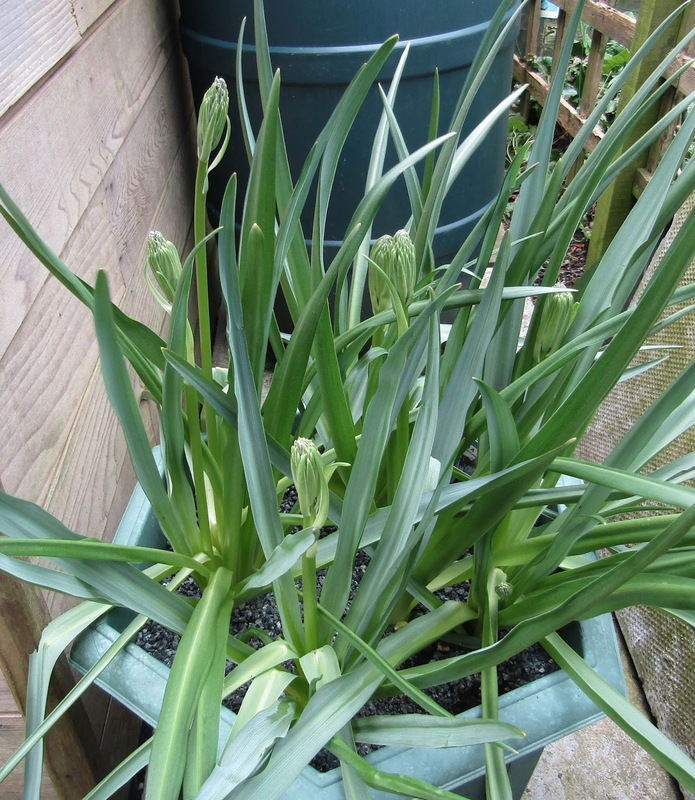 My camassias have enjoyed the recent wet weather. 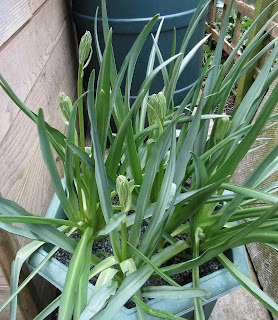 There are flower buds (even though the leaves look a bit battered). The lathyrus vernus plants have put on a lovely show this Spring, despite the unpredictable weather. 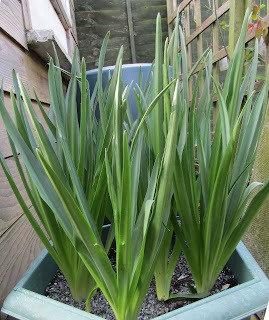 As I prepare the ground and plant I hope our spring bulbs look as glorious as yours. 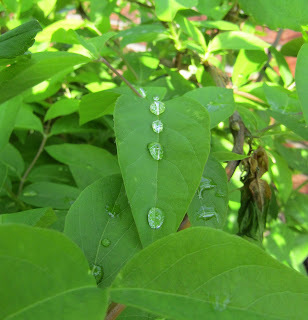 And how I long for rain. We are about to be drought declared I think. Several months with less than ten percent of our average (already low) rainfall. Thanks, EC. 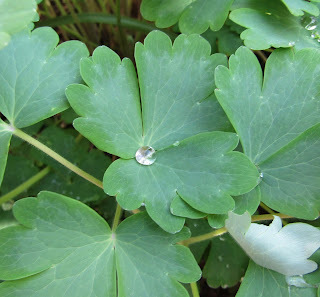 Too little rain is as difficult to deal with as too much rain, isn't it? That balance seems to be extremely elusive. I do hope that you get some rain soon. 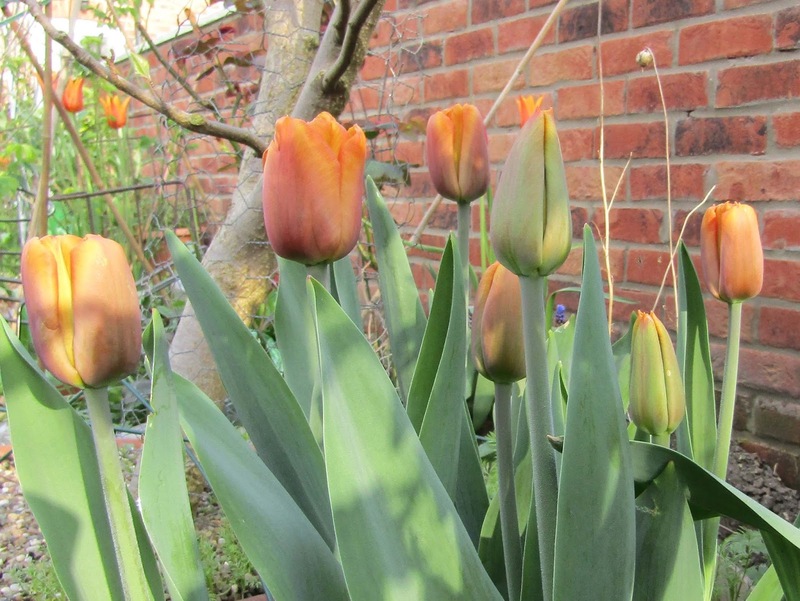 Some of my new tulips are not looking as good as they should but I think this is due to the weather - it was very cold just at the wrong time for them. 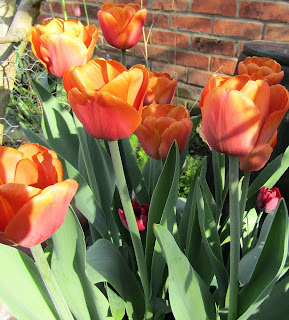 I am enjoying the tulips which have come through though. WOW!! I am sooooooo envious of your gorgeous flowers. LOVE the Brown Sugar one, such a pretty color. 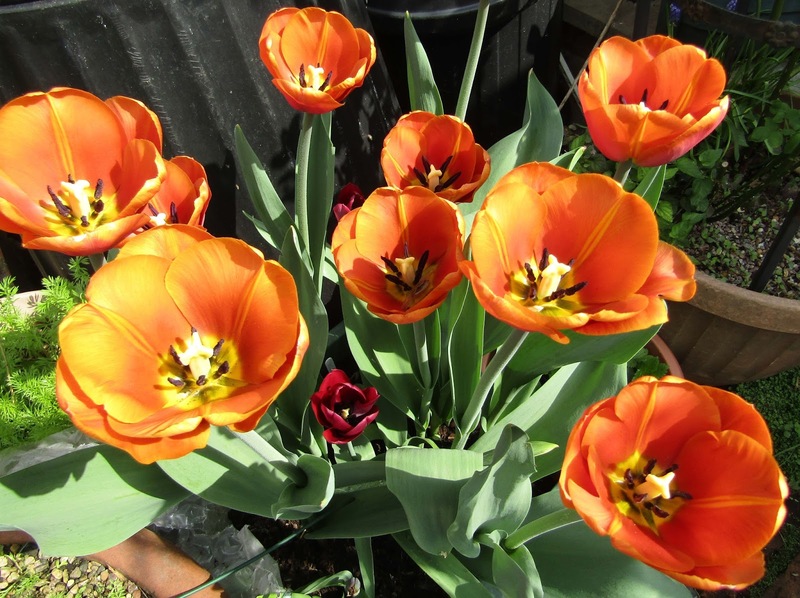 Where do you live that you have so many flowers already? We have frost still 3 days ago, but yesterday it reached 81. Crazy weather indeed. My daffodils are spent, yellow tulips are up and so are the White Joaquils. But, that's about it. 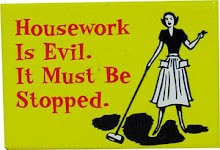 And since I can't get out there and do the winter clean up etc...I can only look out the window. So happy to see your pictures. Thanks so much for your visit and tv recommendation. I made notes! Thanks, Sandy. Our UK Spring has been really cold and things are a few weeks behind. I live towards the eastern side of the UK, in Lincolnshire. I hope you enjoy the TV series I mentioned while you are recuperating.